Adding carbon dioxide (CO2) to the ocean alters the carbonate chemistry and lowers pH, making surface waters more acidic and decreasing the carbonate ions available to calcifiers for calcite and aragonite production. Both forms of calcium carbonate dissolve more easily under conditions of higher CO2, lower temperatures and higher pressures due to depth. 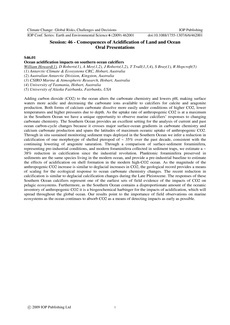 As the uptake rate of anthropogenic CO2 is at a maximum in the Southern Ocean we have a unique opportunity to observe marine calcifiers’ responses to changing carbonate chemistry. The Southern Ocean provides an excellent setting for the analysis of current and past ocean carbon-cycle changes because it crosses major surface-ocean gradients in carbonate chemistry and calcium carbonate production and spans the latitudes of maximum oceanic uptake of anthropogenic CO2. Through in situ sustained monitoring sediment traps deployed in the Southern Ocean we infer a reduction in calcification of one morphotype of shelled pteropod of ~ 35% over the past decade, consistent with the continuing lowering of aragonite saturation. Through a comparison of surface-sediment foraminifera, representing pre-industrial conditions, and modern foraminifera collected in sediment traps, we estimate a ~ 38% reduction in calcification since the industrial revolution. Planktonic foraminifera preserved in sediments are the same species living in the modern ocean, and provide a pre-industrial baseline to estimate the effects of acidification on shell formation in the modern high-CO2 ocean. As the magnitude of the anthropogenic CO2 increase is similar to deglacial increases in CO2, the geological record provides a means of scaling for the ecological response to ocean carbonate chemistry changes. The recent reduction in calcification is similar to deglacial calcification changes during the Late Pleistocene. The responses of these Southern Ocean calcifiers represent one of the earliest sets of field evidence of the impacts of CO2 on pelagic ecosystems. Furthermore, as the Southern Ocean contains a disproportionate amount of the oceanic inventory of anthropogenic CO2 it is a biogeochemical harbinger for the impacts of acidification, which will spread throughout the global ocean. Our results point to the importance of field observations on marine ecosystems as the ocean continues to absorb CO2 as a means of detecting impacts as early as possible.